Eighty years after the opening of young Arieh Merzer's first exhibition, we returned to his birthplace, Warsaw, with the program 'Songs Hand-Hammered in Copper.' 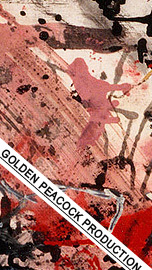 We took with us an exhibition of some of his hand-hammered works. Arieh Merzer exhibited for the first time in Warsaw in 1928. His work was widely acclaimed even before the Holocaust and before it became a memorial to a world destroyed. The show is a musical gesture to our grandfather, Arieh Merzer, one of the greatest artists in hand-hammered copper who, in his works, immortalized life in the shtetl and ancient Jewish music making - the every day life of Jews in their ghettos, of great Hassids and Kabbalists. 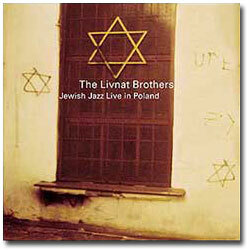 The show consists of traditional Jewish songs, songs of the underground fighters, and folk-songs in modern arrangements slanted with jazz and soul music, in a contemporary jazz arrangement for guitar, saxophone, and vocals. These arrangements combine Jewish jazz and contemporary music; we try to transpose the traditional Yiddish melodies to new musical spheres, nearer to what we experience today. 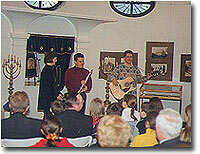 The tour comprised 15 concerts in the following towns: Poznan, Leczno, Krakow, Gliwice, Lodz, and Warsaw. We made the journey in order to participate in the task of bringing Jewish culture back to life in those places where it had been destroyed, leaving hardly a trace. We met an audience thirsting to get to know, to recollect the past, and to learn about that rich culture which had disappeared. Throughout the tour we felt the enormous vacuum left by the destruction of Jewry. In each town we visited, the long history of Jewish existence in Poland and the Jewish contribution to the local cultural, artistic, and economic life were especially noticeable. The journey was characterized by two sets of experiences in marked contrast. 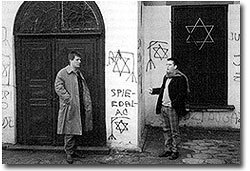 One of them concerned residual tensions that left their mark in every corner in Poland and, to our great surprise, also involved a renewed upsurge of graffiti in the shape of swastikas and racial and anti-Semitic abuse; in addition, they included hate messages that 'welcomed' us on the walls of all the houses on the outskirts of Lodz, and in particular on the walls of the city's last remaining synagogue as well as on the walls of the enormous and dilapidated cemeteries throughout Poland. As against that, the other set of experiences involved a series of fascinating meetings with Poles who were open to discussion and to a renewed understanding of their common history with the Jews. In Krakow we made some very warm friends. 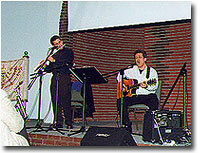 Some of the concerts were held in unusual sites such as a house, in the town of Leczno, which had once served as the ritual cleansing place of the dead and which was now turned into a Jewish museum. One of the highlights of the visit was a concert held on a Friday evening in a church in the heart of Warsaw. The audience consisted of several hundred Poles who, of late, come regularly for Jewish Friday evening services in this church, which stands on the ruins of a Jewish house and whose head is a priest by the name of Quasimir. The story of his life is fascinating in itself. When he was 3 months old, at the height of the Nazi conquest of Poland, he was left on the threshold of a Polish family's home and was brought up as a Pole to all intents and purposes. As a grown up man he chose to be a priest. Only when his adoptive mother was on her death-bed was he told that he had been born Jewish; this led to the blending of his Christian belief with that of his Jewish heritage. He manifested this combination in the way he connected to the Old Testament and in his special relation to Israel and to Judaism. The announcements of the opening of the exhibition in Warsaw reverberated in the news media: on radio, on TV, and in the press. The meeting in the JIH, the Jewish Institute of History, was especially moving when one of Arieh Merzer's early works, from the time when he still lived in Warsaw, came to light. In addition, we found the grave of our grandmother's father in the Jewish cemetery in Warsaw with, on the gravestone, a hand-hammered copper relief that Merzer had created over eighty years ago. The curiosity and open-mindedness of the Poles were also evinced by the openness of the media. Press conferences were held in every town; we were interviewed on radio and on TV, and a gala show in Warsaw was broadcast live on Polish radio. 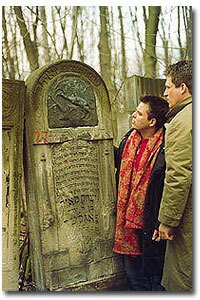 In addition, we found the grave of our grandmother's father in the Jewish cemetery in Warsaw with, on the gravestone, a hand-hammered copper relief that Merzer had created over eighty years ago. 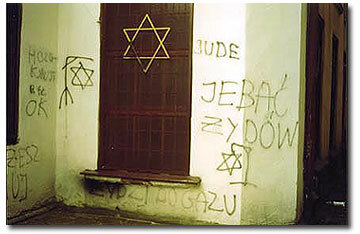 Hate messages that 'welcomed' us on the walls of all the houses on the outskirts of Lodz, and in particular on the walls of the city's last remaining synagogue. Concert held on a Friday evening in a church in the heart of Warsaw.